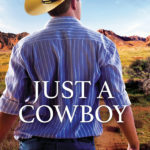 Can an old-fashioned cowboy and a young man on the run from his dark past find a future together? Herschel is a simple rancher who believes everybody deserves a second chance, which is why he tends to hire underdogs—like Dalton, a young cowboy who needs all the support and TLC Herschel can offer. Dalton doesn’t think anyone can forgive him for what he did, but Herschel seems willing to try. In fact, he might be the best thing that has ever happened to Dalton. He might even be the one to help Dalton trust in the future again. Just when he’s about to tell Herschel everything, all hell breaks loose. Herschel must help Dalton break free from everything that’s haunting him, or they’ll both end up alone. First Edition published by Torquere Press, 2010. ← Lots of stuff happening! Click to sign up for the Spurs and Shifters Monthly Newsletter for contests, news, and free fiction from BA and Julia!